Journalists in the country have a free and a suitable environment for their reporting at present under the present government, Non-Cabinet Minister of Mass Media Ruwan Wijewardene said. He said the journalists appear on behalf of the entire society and therefore, it is their role to expose the real truth to the society. 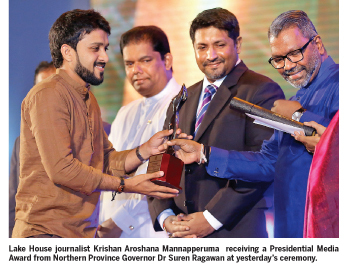 The minister was addressing the country’s first ever Presidential Media Awards Ceremony held at the BMICH yesterday. He said, the web media at present have become the most-used type of media by the people due to their busy lives. “But, due to some web media which provide misleading information to the public, many web media providing true information have faced difficulties,” the minister said. “Journalists are not ordinary people. They have to engage in their profession disregarding their personal lives, the minister said and added that therefore, they expect to help them to go ahead with the new technology. Addressing the ceremony, Northern Province Governor and a member of the Panel of Judges Dr. Suren Raghavan pointed out the need of an investigative journalistic culture in the country to address the prevailing issues. He said there is no such culture in the country simply because journalists are afraid for their lives. “We need to address this issue,” he added. Raghavan also suggested setting up a Commission or a regulatory body for journalistic ethics. “This is more important than anything else”, he added.